Why not have a Fan thread on the late, great, Juan Manuel Fangio! - He would have turned 100 a few days ago ( born on June 24 in 1911). Five times a WDC - in his home country of Argentina, Fangio is revered as one of the greatest sportsmen the nation has ever produced. Argentines often refer to him as El Maestro, el mejor, which loosely translates into The Teacher, the best one. Michael Schumacher on Friday paid tribute to Juan Manuel Fangio, the Argentine legend whose record of five world championships he matched and then broke earlier this decade. Friday, the scene of practice for this weekend's European grand prix, was the 100th anniversary of the late and great Fangio's birth. Speaking at Valencia, seven time world champion Schumacher recalled the early 90s, when he actually met Fangio at a DTM race a few years before he died. "I was struck by how youthful he still looked, even though he was already into his eighties," the 42-year-old told Germany's motorsport-magazin.com. "From his physical coordination and the alertness of his eyes, you could see what a great racing driver he must have been." Of Fangio's 51 grands prix, Fangio started from the front row on 48 occasions and won 24 times. He died aged 84 in 1995. I'm sure we could have some great contributions and memories here from our existing forum members! Awesome!! Its so easy to dismiss the old cars as being antiquated and slow, but really when you look at a car with 400 odd horsepower and maybe 800kgs in weight......they are true speed machines even by modern standards. And drivers like Fangio muscled them around, with mechanical grip only, no real safety.....wow. I would like to see video like that in high-def.....obviously from a restored car lols. 1, Gentlemenly behaviour (not always of course). 2, Drivers were real men, not just trained Oompa-loompa jockeys who have done nothing since primary school other than racing. Drivers were often successful in their own right, with some life experience before they got into racing. 3, They drove those monsters!!! 4, They helped pioneer the inventions that are just normal to us now. I love seeing old racing footages. The cars were really monsters but the racers are not afraid to put them to the limit. - Note: This may create some discussion .... Murray says: "Fangio was an astute person - he ALWAYS drove the best car" !!! I didn't know Fangio broke his neck in a crash - WOW!! Nürburgring 1957 was - along with Nürburgring 1935 - one of the few occasions where a driver just by his genius beats the superiour opposition. Fangio's Maserati against the Ferrari's in 1957, Nuvolari's Alfa Romeo against the mighty Mercedes and Auto Union's in 1935. This is a gem - with the current debate over TO being unfair .... let's go back to 1956 when Fangio won his 4th WDC in the Monza GP. Fangio's Ferrari actually retired (see video at ~ 13.07) .... his WDC was ONLY possible because his team mate Collins who could have also won the WDC gave Fangio HIS car to complete the Monza race! (see video at ~ 13.45). For the first time in several seasons the title fight went down to the wire at Monza. Fangio was well placed on 30 points, but Collins and Behra were eight behind - and could take the title by winning the race and setting fastest lap. Schell again surprised everyone by running at the front in the Vanwall and, when he retired, Moss, Fangio and Collins were left to fight it out. Fangio's hopes faded with steering trouble, but he was saved when Collins - who could still have won the title - stopped and handed his car over. It was a remarkable gesture, which Fangio would never forget. Despite a scare when he ran out of fuel, Moss just held on from Collins/Fangio in an exciting finish. With BRM and Vanwall having already shown well during the year, it was Connaught's turn to earn some success as Ron Flockhart took advantage of a high attrition rate to come in third. Further British success seemed just around the corner. The video takes awhile to download, but it's worth it ....... Interesting stuff !!! 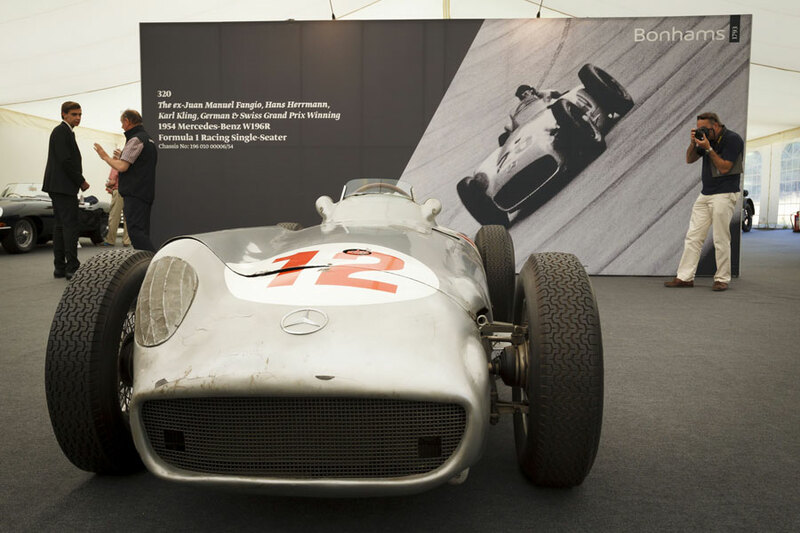 A 1954 Mercedes W196 has sold for a world record auction price of £17.5m at the Goodwood Festival of Speed. The auction - carried out by Bonhams - saw the car eclipse the previous auction record of £11m ($16.7m) paid for a Ferrari 250 Testa Rossa in 2011. After commission and taxes are taken in to account the W196 reaches a total of £19.6m. The ex-Juan Manuel Fangio W196 went up for auction having been found in a warehouse earlier this year, with initial estimates expecting the car to sell for around £5m. However, it went for over three times that amount, with racing historian Doug Nye describing it as "a beautiful survivor" when it was discovered. "The first time I saw this car I needed oxygen; it's landmark technology and it was driven by a landmark driver," he told Eurosport. "Some people think it looks grotty - that's not the point - the really rare cars today are the unrestored ones. "Every car that's restored has lost a part of its history because it's been obliterated by repainting or by rebuilding. Nothing's been obliterated on this; it's just a beautiful survivor." The exact car won the 1954 German and Swiss grands prix as Fangio secured the second of his five world championships.